Which pets are currently available in Maestia? There are currently five pets available? General pets (excluding Ruby) are available in three colors. From Green to Blue to Purple (rare). Rare colored pets have a bigger bonus then regular ones! e.g. 210 Critical Magical Hit instead of 200. Faye and Kum can be purchased in the premium shop for either Luma or Orbs. Some of those pets are available in various colors! General pets (excluding Ruby) are available in three colors. From Green to Blue to Purple (rare). Rare colored pets have a bigger bonus then regular ones! e.g. 210 Critical Magical Hit instead of 200. How many pets can I have, do those have a duration? There is no limit on how many pets you can collect. However you can only have two pets active at the same time. Pets you don’t need you can hand over to Pet Shepherd Rud in Superion. All pets are permanent, there is no duration on them. What is the use of those pets? Each pet has a permanent buff based on the saturation of the pet. – With decreaed saturation level the bonus effect will drop. 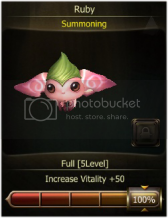 Ruby grants 50 vitality points at 100% saturation. At 50% saturation the vitality buff has dropped to 30 points. 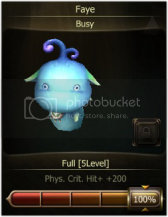 Buffs of the same pet type do not stack! Therefore it makes more sense to travel with two different pets instead of two of the same type. The buff is only applied to your player character and will not be available to allies or party members. Do I need to feed the pet? Pets can be fed with gold until the saturation level is maxed. In the shop you will find additional premium pet food. There are 5 different food types available for either Luma or Gold. For a certain duration the pet will grant you another bonus effect, like e.g. additional 30 Agility. 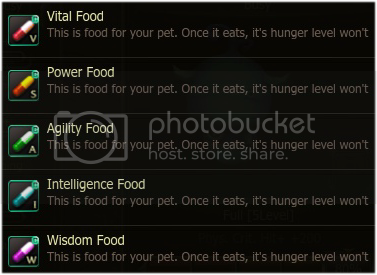 While the premium food is active, the saturation level of the pet will no longer fall. This will save you some gold for sure. Premium food buffs do not stack. You can’t give the same premium food stat to a pet with the same stat on it and you can’t use the same premium food on both pets (if you have two pets) at the same time. Will my pet die sometime? No, you pet will neither die nor getting attacked by other players or monsters. However if you pet saturation reaches zero your pet needs to be revived with an “Pet-Phoenix Scroll” which you can get at Eirin and Ellandir in Superion for 43,200 gold. If you want, you can permanently remove a pet from your collection. Will my pet participate in combat? No, you pet likes to sit down and watch and of course it will follow alongside you. Can I trade my pets? No, you pets cannot be traded in any way. 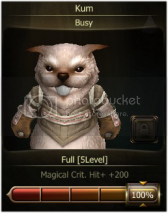 Can I use the pet while wearing premium customes and equipment? Yes, the pets are seperated from the premium costumes. What happens with my pets when I logout? When you are logged out, the saturation level of your pet/s will decrease. You should hand your pets over to Rud in Superion if you plan to logout for longer. 100% feeded pet will survive 166h, 7 days when logged out. When I hand my pet over to Rud in Superion, will this cost any gold? Handing your pet over to Rud will not cost any gold. Stored pets no longer loose saturation as Rud cares for them. Rud charges you 2 Gold per Minute per pet, but not more then 61,700 Gold for 10 days straight.